Shipping is free both ways. 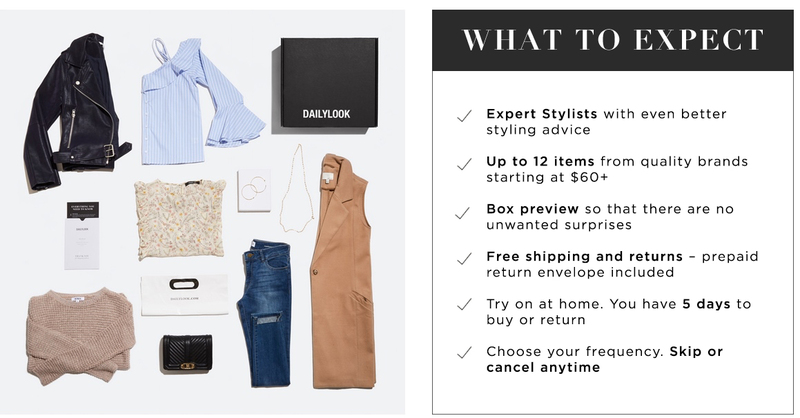 Each box has a $40 styling fee which applies towards items that you keep. The service is free if you make a purchase. Items in your box generally cost $60 and up per item. You only pay for what you want to keep. There's no pressure. Receive a box monthly, every other month, or quarterly. Or choose to skip a box altogether. Absolutely no commitment. Cancel anytime. Delivered right to your door, you can try on each item conveniently at home. Keep only what you want. Pick your delivery date. Keep what you love and return the rest within 5 days, absolutely free! After 5 days, you are only charged for what you keep. Each box contains up to 12 hand-selected items from $60 and up. Easy returns via prepaid return label. Discover the latest fashion brands, risk free. "I cannot wait for this box to come. I am going to spend all my money on this - everything looked incredible! AH! I don't know how you do it without ever meeting me but you nailed it." "Thank you so much for sending my box. 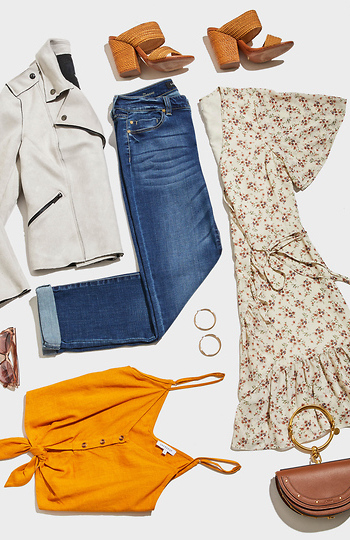 I was extremely hesitant after my experience with Stitch Fix and felt like my style wasn't being captured. I'm so glad I was proven wrong. These styles are me but BETTER; you picked items I would never have been savvy or brave enough to pick on my own." "I've subscribed to several of Daily Elite's competitors, and this is by far the best styling I've gotten from any of the other companies. I really felt like my stylist read my original feedback, and I thought it struck a really great balance of new/interesting things that still fit within my style." "I am so impressed with the selection of items you included! I'm thrilled to be a part of this service. So glad to have gotten such a great selection of items, and not having to leave the house for it or deal with the mall is fantastic!" "My stylist said in her note how she looked through my blog and Instagram and saw one of my recent posts about off the shoulder tops. I LOVED the personalization, which I really didn't expect." "Thank you for making my DL Elite Box experience amazing! I am definitely satisfied with my boxes. It's evident that you took the time to read my style preferences and picked out the clothes that I would like. I will definitely use this service again and hope to get more awesome additions to my wardrobe." Are You Ready To Get Styled? Visit our Facebook page to see what all the buzz is about.